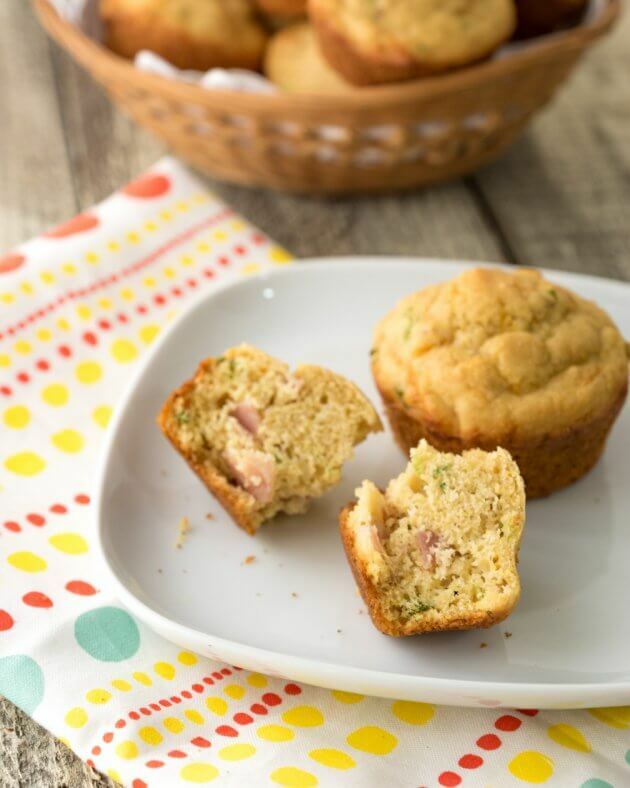 Ham & cheese muffins are an easy make-ahead healthy breakfast recipe to grab during the morning rush. 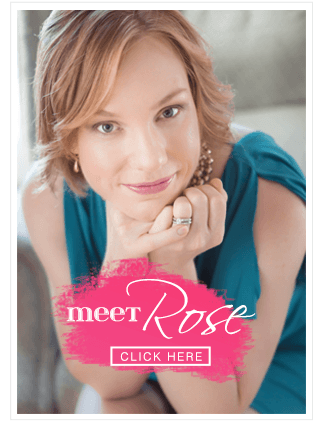 Even though I work from home, I want to show up at the office the same way I would if I worked for someone else, ready to go. To achieve this goal I need healthy breakfasts that are quick enough to fit into our already full morning. 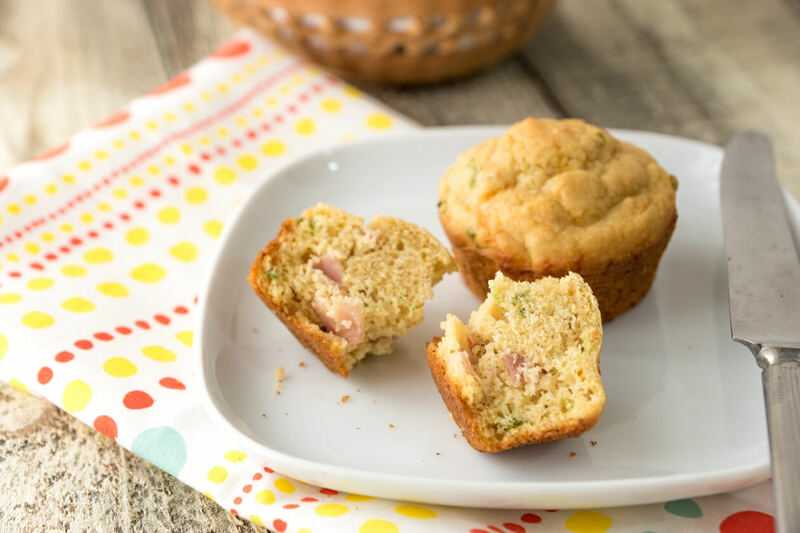 Make ahead recipes like these ham & cheese muffins are an excellent way to enjoy an easy and satisfying breakfast even on the craziest mornings. My morning commute is a bit out of the ordinary. Every day begins, like I imagine many of yours, by getting out of bed a little begrudgingly. Once on my feet I jump into action. My boys almost always want different things for breakfast so while bread is toasting for one I pour cereal for the other all while throwing together the ingredients for a packed school lunch. Somewhere in the mix I brew up a pot of coffee, a component of my day that has become no less crucial since switching to decaf last October. With coffee in hand I dig clothes out of the clean laundry baskets and get everyone dressed using a combination of cheerful praise and barked threats. Finally, we rush out the door, drop the gear for one boy in the car, then take off at a run for the elementary school 3 blocks away. Once we complete the school drop-off my youngest has a little routine of checking out the playground and climbing a few rocks before we head home to hop in the car and drive him to daycare. When both boys are dropped off I head to my office which probably doesn’t sound odd at all except my office is in my house. Everyday we have this whirlwind to get everyone out the door only for me to turn around and come right back home. Maybe it isn’t that unusual but it feels funny to me. Ham & cheese muffins can easily become the star of a weekend brunch. 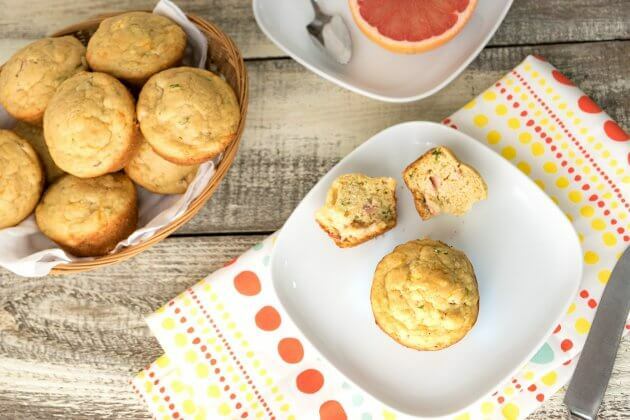 Simply serve these savory muffins with some fruit and a lightly dressed green salad. Ham & cheese muffins with a pepper jack kick. An easy recipe to make ahead for weekday breakfasts. Also perfect for weekend brunch or give to a new mom who needs some easy comfort food. Heat the oven to 350F. Prepare your muffin pans by wiping 18 muffin cups lightly with oil. Whisk together the buttermilk, eggs, oil, and syrup. Add the buttermilk mixture to the dry ingredients. Stir just enough to combine. Rest the batter for 10 minutes. Then fold in the cheese, ham, and onions. 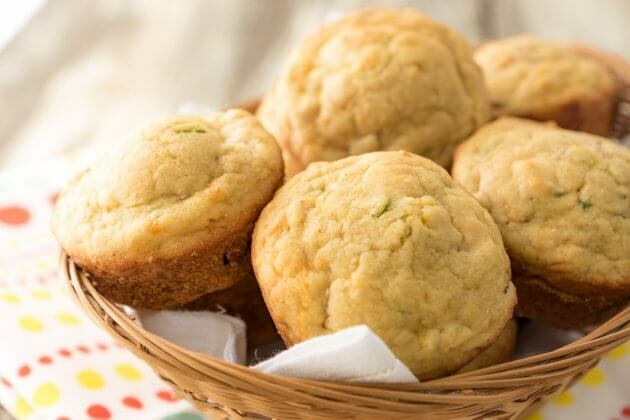 Divide batter evenly into 18 muffin cups. Bake 18-20 minutes until a toothpick inserted into the center of a muffin comes out clean. Resting the batter gives the bran in the whole wheat flour time to hydrate. This results in a moister muffin. To suit a milder taste preference: You may use cheddar cheese in place of the pepper jack. You may omit the onions.